Reston Golf Courses | Where Can I Play Golf in Reston? 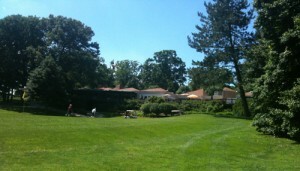 The Hidden Creek Country Club golf course on a beautiful June afternoon. Many consider golfing the perfect sport. I can definitely agree with that on those glorious days when the sun is shining and a light breeze carries the aroma of honeysuckle through the air. On those days, nothing beats grabbing the clubs and heading over to one of the two amazing Reston golf courses: Hidden Creek Country Club and Reston National Golf Course. Legendary golf architect Ed Ault built both of these beautiful courses. So, for you golf enthusiasts, here is the low down on Reston golf courses. Located in North Reston (near both Lake Anne and Reston Town Center), the Hidden Creek Country Club course is a classic, playable design renowned for its meticulously landscaped tees and greens where beautiful plants and flowers adorn each hole. This PGA-quality course is a favorite for serious golfers. Click here for club membership information. Located in South Reston, Reston National Golf Course is Reston's public golf course. This secluded course is full of shaded fairways that provide a tranquil environment for any kind of golf outing you can imagine. Visit the restaurant or the clubhouse before or after your game to prolong the fun. Click here to book your tee time.